Search for the most effective snoring remedies and sleeping solutions. 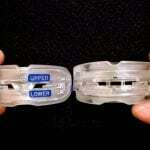 Compare the best anti-snore aids and sleeping solutions. Write detailed reviews based on more than 100 000 customers feedbacks and our quality tests. Recommend the best and most reliable anti-snore products in the world. Publish wide-ranging articles about how to stop snoring in general, snoring causes and consequences. Help to identify the type of snoring that affects you to prevent some dangerous breathing problems like sleep apnea. Avoid long, boring, and non-useful narratives. We write only the facts to give you a quick and informative read. It's a breathing disorder that occurs while asleep accompanied by a low frequency rattling sound. In some cases, snoring is associated with the onset of respiratory arrest, known as apnea, which results in oxygen deficiency to the primary organs and vital systems due to the failure of the lungs to function effectively, which can increase the risk of infarction and stroke. Snoring disrupts a good night's sleep for the snorer and everybody around him or her because it breaks the silence of night. Age. As we grow older, our throat becomes narrower, and the muscle tone in our throat shrinks, which can cause snoring. Excessive weight. Even a small amount of excessive fatty tissue around your neck can prevent a smooth flow of air to your throat, which may cause snoring. Biology. Your gender and build can influence the likelihood of being a snorer. If you are a man, you are not as lucky as women in this case. Blocked airways. Flu, allergy and all the reasons that make your nose stuffy or cause airways to be blocked is a path to snoring. Alcohol, Smoking, and Drugs. These relax your muscles in an unnatural way and leads directly to snoring. Sleeping position. When you sleep on your back, you produce more tissue on your throat, and you are more likely to snore than when you sleep on your side. Because you don't get enough sleep. You have a lower attention span. It leads to higher blood pressure, a more frequent heartbeat, and sometimes cardiac rhythm disorders. Snoring may lead to hypertension and arrhythmias. It may increase the possibility of infarctions and stroke. Snorers associated with apnea frequently have impotence issues. If you snore with a closed mouth, it reveals some tongue problems. Snoring with an open mouth makes the throat tissue problems more visible. Snoring while sleeping on your back is the most common situation and can be easily addressed. A change in your sleep position and living a healthy lifestyle could be enough to stop snoring. If you snore in every sleep position, this may indicate a serious problem and require a thorough examination. Elevate your head four inches from your current head sleeping position to ease breathing. Change your sleeping position from your back to your side by attaching a small round object (e.g., tennis ball, etc.) to your t-shirt or pajama top to make rolling over onto your back uncomfortable. Reduce the amount of dust and pet dander in your bedroom. 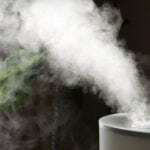 Use a humidifier to moisturize the air in your bedroom. Try to avoid sedatives, alcohol and sleeping pills. Avoid the consumption of the following products before sleep: dairy products, animal products, soybean milk, caffeine, grains, soy, sugar, bananas, potatoes, corn, and cabbages. What products will you most likely find in the anti-snore device market? 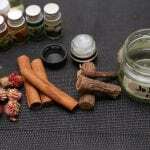 Most of them consist of ingredients such as peppermint, menthol, water, glycerin and alcohol. Generally they are recommended to be taken about a half an hour before sleep, and most bottles last for about a month. 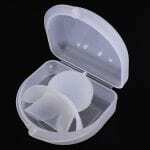 The main concept behind anti-snoring pillows is the idea of once a snoring person is positioned on it, snoring stops. There are three major types of anti-snoring pillows: wedge, me﻿﻿﻿mory﻿﻿﻿ foam and cervical support. But we will also discuss a 4th type for CPAP, BiPAP and APAP machine users. These devices are also called oral appliances or dental sleep equipment. Their main advantage is to unblock the air passage by moving the lower jaw forward. Also known as a tongue stabilizing device – TSD - it holds the tongue forward during sleep to prevent it from blocking the airway. Its primary task is to keep your lower jaw firmly in place. As a result, the mouth stays closed and this forward position of the jaw reduces the risk of tongue and throat tissues falling back to block the airways. 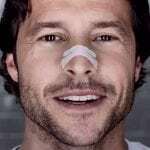 If you snore due to blocked nasal passages, then this device might be the right solution for you, but it may take some time to get used to sleeping with a device placed into each nostril. Still, the best products on the market are made from soft, medical-grade silicon which shouldn’t be too uncomfortable. However, if you find that this type of device works to reduce or eliminate your snoring, be advised that this is not a temporary fix because you will need to use it for life. Manufacturers produce them from elastic, spring-like straps that fit directly over the flare of the nostrils. The bottom is sticky so that once placed on the nose they stay there. As the strips attempt to get back to its core shape, they elevate the sides of the nose and spread the nasal passages. This process helps to the open of the nostrils and makes breathing easier. CPAP. This kind of treatment uses positive air pressure to hold the airway open during sleep. A pump generates this pressurized air . It is called a CPAP machine and applied through a small mask which fits over the nose or the nose and mouth. BiPAP. This device has two pressure settings. One is for breathing in (IPAP) and a moderate pressure for breathing out (EPAP). When you inhale air, the pressure will increase to the selected value and decrease when exhaling. 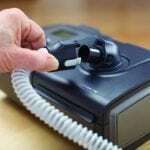 BPAP machines are often used by sleep apnea patients when CPAP machines are unsuccessful. APAP. APAP machines have pressure settings that are not limited to a single point, but to a range of pressures. These machines are built to automatically fluctuate within this range when it delivers air. APAP machines use algorithms that sense subtle changes in your breathing and adjust themselves to the best pressure setting at any time of night. These devices stimulate the snorer by delivering tiny electrical pulses every time the person snores to make him or her change sleeping positions until the position is found that causes the snoring to stop. These types of sleeping solutions temporarily help to liquefy and make mucous thinner, open blocked airways and reduce inflammation. They also decrease the production of phlegm in mucous membranes. There are ten types of oils recommended as a remedy to relieve snoring: thyme, eucalyptus, peppermint, mint, sage, cedar, lavender, marjoram, lemon and valor. The most common ways to use essential oils to prevent snoring is by gargling, diffusion, massage therapy and bathing. First of all, please, visit a doctor to identify the primary reason for your snoring. It is vital to determine if you have a snoring disorder or sleep apnea. This difference may be a vital turning point for your health. Do the research. Some people get relief from sprays, oils, nasal dilators, etc. But many doctors don't recommend their use. ​Try behavioral changes first: quit smoking, lose some weight(if necessary), or change your sleeping position to your side. There are five main types of anti-smoking products. Some of them are over-the-counter such as: nicotine patches, nicotine gums, and nicotine lozenges. But others require a doctor’s prescription to purchase nicotine inhalers and nicotine nasal sprays. 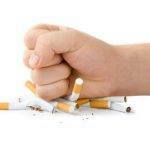 NRT (Nicotine Replacement Therapy) probably is the most commonly used remedy to quit smoking. It reduces withdrawal by giving you a small portion of nicotine, but not any of the other harmful chemicals found in cigarettes. One of the causes of snoring is when the tissues and membranes in your throat become parched during the sleep. Asleeping solution such as an air moisture humidifier makes the air wet in your room and keeps your throat moist all night long. There are four main types of this device: ultrasonic mist, evaporative mist, steam vaporizer and air washer. When you have trouble relaxing due to ambient sound, earplugs specially created for sleep are a great answer. 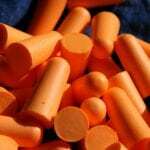 These are the most common types of earplugs: custom, disposable and moldable. The main difference between these earplugs is shape and durability. White noise helps you relax before sleeping by providing a continuous, calming sound for your mind to settle on. It helps to calm the brain and prevents you from concentrating on disruptive sounds that can distract you from falling asleep. When you fall asleep, white noise machines continue to run the entire night to drown out different sounds that may awaken you. This helps you sleep better and allows you to wake up more refreshed.